We’d love your help. Let us know what’s wrong with this preview of Rift by Cindi Madsen. Summer Davis is a Cipher, a person chosen to help people resolve problems with their loved ones before they die. She’s just gotten her second job when weirder-than-usual things start happening. There seems to be a rift between her and the afterlife, and she’s seeing things she shouldn’t, including people who have already passed on. As she struggles to help her new assignme Summer Davis is a Cipher, a person chosen to help people resolve problems with their loved ones before they die. She’s just gotten her second job when weirder-than-usual things start happening. There seems to be a rift between her and the afterlife, and she’s seeing things she shouldn’t, including people who have already passed on. As she struggles to help her new assignment, Liam, make amends with his incarcerated father, she finds it hard to balance being a high school student, Cipher, and girlfriend. To ask other readers questions about Rift, please sign up. Holy Guacamole!!!!!! This book was awesome. I couldn't put it down.....I swear my heart skipped a beat or maybe a thousand of them while reading it. I love love love Summer, she is my kind of girl, she is strong, passionate and she never gives up, she is a fighter!!!!!! I cried reading Cipher and I tell you I had to check myself a couple of times so I wouldn't cry while reading Rift, I don't mean it is a sad story but the heartfelt moments are very touching, it is impossible not to want to reach Holy Guacamole!!!!!! This book was awesome. I couldn't put it down.....I swear my heart skipped a beat or maybe a thousand of them while reading it. I cried reading Cipher and I tell you I had to check myself a couple of times so I wouldn't cry while reading Rift, I don't mean it is a sad story but the heartfelt moments are very touching, it is impossible not to want to reach into the pages and hug the characters. Ohhhhh Troy......you are my book boyfriend now. Marry me and let's run into the sky chasing rainbows on my glittery unicorn. So yeah, I recommend and totally beg you to read this series. RIFT has many layers and brings a new depth to Summer's story. First, there's Liam, her next assignment as a cipher. I just KNEW going into this book that having a good looking, college aged hottie taking up her time would cause issues with her relationship with Troy. And it did. And it SUCKED. There's just really no other way to put that. Sorry. Then there's a new cipher "side effect" that presents itself. While there are some benefits to this new gift, (OMG I TEARED UP WHEN [BEEEEEEEEEEP] AND [BEEEEEEEEEEEEP] HAPPENED!) the downfall and it's resulting creepiness brings our dear Summer to both physical and emotional exhaustion. There was one chapter that ended with such a creepy factor that I had to count to ten twice before I flipped the page. I was scared, yo! I found my patience with Summer wearing thin at one point of this book. I know she knows Troy is, like, the best boyfriend ever and I want her to just let go of her fears and TRUST HIM. He's proven over and over and over and over and over again that he loves and accepts all of her, yet she keeps holding on to secrets. C'mon Summer! Let him in! 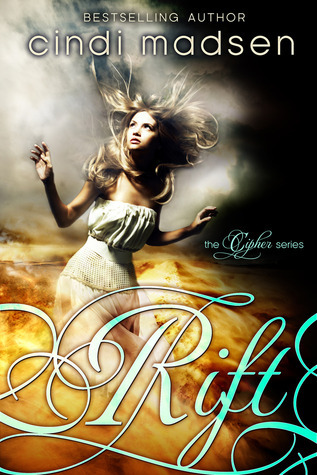 I might go as far as saying that CIPHER and now RIFT are my favorite Cindi Madsen books. I love the main characters (especially while shirtless and wet), I love the world and I love the people that come into Summer's life because of her job as a cipher. I finished RIFT with a genuine "feel good" feeling. For now. Here's hoping that RESOLUTION, book 3 in the series, proves that LA is a-ok. Fantastic, awesome, truly amazing. This series is a really good read can't wait to see where she takes it next. As awesome as the first...starting book three tonight! Rift, the second book in Cindi Madsen's Cipher series, about a young woman who's inherited the job of helping the dying mend relationships before they die. In the first book, Summer learned what it truly meant to be a Cipher, and came to terms with how it would affect her life. And she won the boy. In Rift, Summer continues to help those who need her, but she's also dealing with just how much this phenomena disrupts her life and relationships. But not only does she have this to contend with, but Rift, the second book in Cindi Madsen's Cipher series, about a young woman who's inherited the job of helping the dying mend relationships before they die. In the first book, Summer learned what it truly meant to be a Cipher, and came to terms with how it would affect her life. And she won the boy. In Rift, Summer continues to help those who need her, but she's also dealing with just how much this phenomena disrupts her life and relationships. But not only does she have this to contend with, but a strange occurrence has her seeing the dead, and the balance between average teenager and Cipher is harder to maintain. So though I don't often read paranormal books, I really do enjoy this series. Some of that is attributed to the fact that I see this series as Magic Realism, with the paranormal being a part, but not all of the story. I feel that Madsen has done a thorough, and interesting, job of creating the Ciphers. What I really appreciate about Rift, and the whole series, is that the heart of the story, is a young woman who is trying to not only help those who need her, but is also balancing school, a boyfriend, friends, issues with her dad, among others. This is a story that I enjoyed, but I feel is the perfect fit for teens. Many readers have taken issue with the portrayal of teens in some of the popular paranormal romances. These issues have included passive heroines, controlling heroes, and an unrealistic or unhealthy portrayal of the lives of teens. But in the Cipher series, Madsen has done a very nice job of conveying healthy, honest, and realistic situations. Not only is Summer a Cipher, but she is also dealing with a friend in crisis. She has a boyfriend she loves, but is unsure about taking the next step in their physical relationship. Her dad is ready to become more serious with his girlfriend, but Summer is afraid her mother will be forgotten. I find stories like this, in which any teen can find something to relate to, to be invaluable. And the fact that Summer's story is so thoughtfully told makes it more so. Rift was a very good addition to the Cipher series. As usual, Madsen's writing is very charming and fast-paced. I'm not sure at all what is going to happen next in the series, but I'm excited to find out. "Keep your shirt on." Liam looked at her and grinned. "Or don't." Summer smacked him. "Very funny. And just so you know, no matter how excited I get, the shirt's staying on. Who really rips their shirt off when they get impatient?" "I do love Kendall. You know how she can be. She's bossy and demanding, but she's smokin' hot, and she can be sweet when she wants to be. And dude, so many guys are jealous-- they'd kill to be in my place." I loved this sequel! I enjoy her capabilities and the complexity of it all. Characters. Plot. Can't wait to start the next one.